Instead, the scientists took an approach new to the field: machine learning. By running the data through a pattern recognition algorithm, they identified that the paths of the atoms formed a distinctive shape that looks a bit like a turtle—which helped tease out the physics behind it. The results, published Feb. 1 in Science, improve our understanding of quantum dynamics and offer an innovative way to study quantum phenomena. "In understanding complex quantum dynamics, we start to be limited by our intuition, but machine learning could be a new tool for understanding such systems," said lead author Cheng Chin, a professor of physics at the University of Chicago and a pioneer in using ultracold experiments to study the quantum phenomena that underlie the behavior of the smallest particles and the universe. In the original study, Chin's lab cooled particles down to nearly absolute zero until they all condensed into the same quantum state, called a Bose-Einstein condensate. Next, they applied a magnetic field, and were surprised to see atoms shooting out in bright jets. But the exact pattern was hard to tease out among the noise. Graduate student Lei Feng, the first author on the new study, developed a machine-learning algorithm to search the results for patterns and correlations that human eyes don't always see. "This is similar to looking at the flow of people moving at a train station," Cheng said. "At first it looks random, but if you observe carefully, you can find families traveling together, business people going to meetings and so forth." The algorithm picked out a correlation in a shape that resembles a turtle: a ring around a central source that forms the "shell;" four secondary points that appear like feet around it; and two extended points as the "head" and "tail." "If you see a particle going in one direction, there's always another at a 45-degree angle," Feng said. Essentially, it's a series of chain reactions: The first particles interact close to the source, bouncing off each other; the next ring forms as those particles interact, and so on. The physics behind the phenomenon is termed high-harmonic generation. "In essence, each image consists of many such turtle patterns," Cheng added. "It is turtles all the way down." "We confirmed the pattern recognition with a traditional correlation method," Feng said. 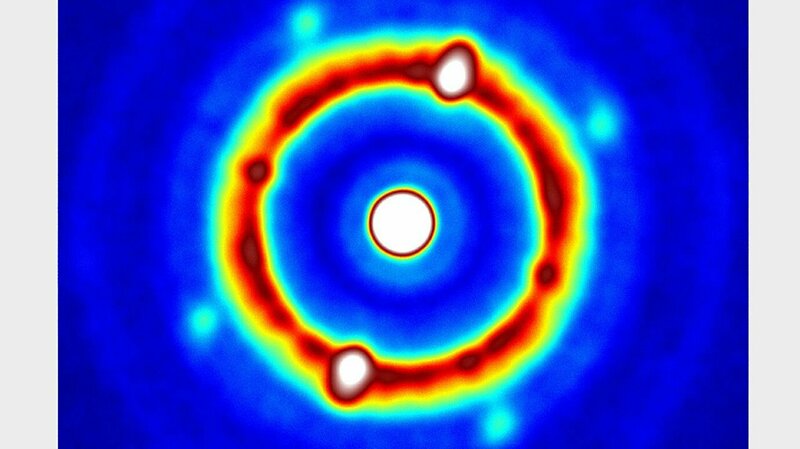 "That works by looking at the relationships between each pair of atoms, which is less comprehensive than the pattern we found." The scientists think machine learning could be very useful in revealing novel phenomena in the study of quantum dynamics. "Recognizing a pattern is always the first step in science, so this type of machine learning could identify hidden relationships and features, especially as we shift to try to understand systems with a large number of particles," Chin said. A greater understanding of these behaviors could one day feed into technology, he said, such as ways to extend the reach of quantum networks across greater distances.